This film is my first stab at creating a digital story, the result of a digital storytelling course facilitated by Breaking Barriers Community Arts that I did over Easter. School was finished for the day and there were still a fair few hours left until teatime. Jenny’s grandmother, anxious to have Jenny out from under her feet whilst her parents were still at the factory and she was busy cooking, told her to go out and play. It was the usual daily routine. Jenny went out and was unsurprised to see Mary already out on the street. Jenny sat down next to her on the kerb of the pavement and saw the she was sucking on a bright orange lolly. “Where did you get that?” asked Jenny. Grandmother didn’t know what possessed her to take the journey at rush hour but she regretted it when she found herself struggling to get on the train from the packed platform. She found herself swept up by the tide of people onto the train, where she was wedged in between the crowd and a plastic panel. Luckily a young lady beside her made a fuss and got someone to give up their seat for her. Grandmother didn’t normally like a fuss but it was worth it in this case. She sat down and arranged her shopping basket on her lap, which was full of tins, bread, milk, sausages and some yellow daffodils poking out the top. The tube train thundered along. Someone in the carriage was obviously smoking, the smell of burnt tobacco caught in the back of her throat. She wished she’d had some water. Just outside Tower Bridge the train inexplicably ground to a halt. Even worse, all the lights went off and the carriage was plunged into black darkness. Grandmother was very alarmed but also confused – no-one else seemed at all put out by this and the other passengers carried on staring fixedly into space. She could hear muffled drumbeats from several ipods, their owners absent-mindedly nodding their heads along to them. Just at that moment, the worst possible thing happened. A spider dangled down from the carriage roof, right in front of Grandmother’s face before coming undone and landing, ‘plop’, on her her hand. Grandmother hated spiders and one landing on her in a pitch-black, overcrowded tube train was more than she could take. She screamed long and loud. The other passengers seemed to suddenly wake up and react. As the lights came back on, everyone was staring at her, silent and open-mouthed. Grandmother vowed never to take the tube again. Well, it’s that time when I take a look at the blog and realised it hasn’t been updated for two months. So it made me think on what the hell I’ve been doing for the last couple of months and realise things have been pretty busy since settling into my new Cardiff home. Here’s a quick recap on some of it (for myself more than anything). I’ve found myself going to London quite a lot, for work and pleasure. I’m just about getting used to landing in Paddington rather than Euston now. A lot of my trips have been to deliver Talk About Local training sessions, which is when I definitely see quite a different side to London than I do as a regular visitor/tourist. I find myself visiting areas I’d never think to go to otherwise, such as Walthamstow (for a Nesta Neighbourhood Challenge project training session), the Priory Green Estate in Kings Cross and Lambeth North (for training with Peabody Housing). I find I’m learning to a lot about London’s places and people as a result. During the last training session with Peabody I heard Steve’s story about the Cumberland Market Estate, previously owned by the Crown Estate. Steve was an active part of the residents’ Our Homes Are Not For Sale campaign to prevent the estate from being sold to private developers when the Crown Estate announced their intention to sell in 2010. The campaign worked well, influencing the Crown Estate’s decision to sell to social landlord Peabody. But not all the London visits are all work and no play. I also found time to go to Matt Locke’s gorgeous The Story and Carl and I managed to create a lovely long London weekend break around the Guardian Open Weekend, where I took part in a panel discussion on hyperlocal journalism. The event itself was great fun – full of good food, thinkers and things like The Book Barge and that guy who dances like a lobster. Carl and I found ourselves drawn back to Birmingham for the brilliant Flatpack Festival. We spent Saturday night at The Edge, which had been transformed into a remote Peruvian fluoro village in the mountains with equally colourful locals for the Outersight Overnight Psychedelic Psynema Psleepover. Despite the cinematic strangeness being projected over our beds I slept like a baby until we were awoken the nest morning and invited to watch the sunrise on the roof. It really was quite magical and I left feeling I’d spent the night in some far-flung land rather than familiar Digbeth. The next day I had a Filum Afternoon in the Spotted Dog as part of Flatpack, screening some Mitchell & Kenyon in Ireland archives and Nichola Bruce’s haunting, dream-like film I Could Read The Sky. I loved this film when I first saw it a couple of years ago – Dermot Healy plays an old Irish immigrant padding around his London bedsit whilst he recalls his life, which has been far from easy. Certainly not a ‘feelgood’ film but I found it beautiful all the same. Being back in the Spotted Dog for Filum made me reminisce for the good old days, I do miss those gentle Monday nights in the pub, watching Irish films whilst drinking tea and eating cake! I’m back in Birmingham again this weekend for the #TAL12 unconference, which we’re a busy bunch at work gearing up for. I’m particularly looking forward to providing Friday night’s entertainment – giving people who are there the night before a guided tour of Digbeth! As well traveling a fair bit I’ve also been busy at home, getting to know my new Cardiff neighbourhood and what’s going on locally. I was delighted to be asked to speak at the February WordPress Users Wales meetup about working with WordPress with Digbeth is Good and in my Talk About Local work. I met some great people there who really opened my eyes to the Cardiff’s emerging hyperlocal scene, which prompted a lengthy blog post detailing some of the very many sites and projects around. I also worked with anti-smoking charity Ash Wales, assisting them with their interview process for their new role of Social Media Expert Officer. It’s a fantastic position and unsurprisingly there were many applications, which made for a full days’ interviewing. One thing I learned from the exercise is there really is no way of foreseeing what will happen sometimes. Before the interviews, I created a series of questions, one of which was ‘Describe a particularly effective social media campaign that did a lot to raise awareness of and engage new audiences in a worthwhile issue. What about it do you think made it so successful?’ I was basically looking to see how candidates were watching what other were doing online and taking away lessons from that. But of course, just before the interview date Kony 2012 went and happened!! 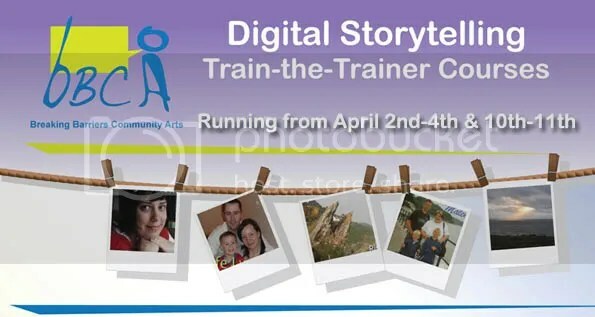 Rather than go away for the Easter break I stayed at home and attended a ‘train the trainer’ digital storytelling course in Ebbw Vale facilitated by Breaking Barriers Community Arts. I was tempted by this when I saw a previous run of the course advertised last year but couldn’t attend then, so was very happy to have gotten to go this year. It was great 5 day intensive, which focused as much on the process of drawing out and developing a good story as it did the more technical aspects of building a digital story. By the end of the course we had all created a short digital story film – I’ll be sharing mine on here shortly, just as soon as I’ve made some little tweaks! When I last saw my nutritionist she advised me to meditate or do some sort of activity to help me relax. I’ve not gone for meditation but I have been making sure to take some time out – long evening walks in Bute Park, the odd lunchtime picnic in Llandaff Fields, getting my drama fix from Netflix and filling Carl’s Facebook profile with costume dramas as a result. I’ve also the taken the time to learn a little bit of Welsh at Chapter Arts Centre, who hosted free Tuesday morning conversational Welsh sessions for beginners over February-April. Admitedly, I learned just a little (languages never were my strong point) but it was good fun and a nice way to meet people . I’m hoping to find some time to follow this introduction up with the help of Say Something in Welsh – a series of brilliant, free-to-download podcast lessons for beginners with regular local meet-ups for the online community that’s developed around it. In terms of nutrition, according to Getgood Eats I’ve not eaten for over a month. A stomach upset kind of put paid to the strict diet for the moment but hoping to meet with nutritionist next month and try to get back on that wagon. Let me elaborate on that a little – I find communication with Birmingham City Council difficult, it never feels forthcoming. Councillors very rarely attend Digbeth Residents’ Association meetings (I think Councillor Yvonne Mosquito has attended a couple of times over the years) and since our treasured Neighbourhood Manager Andy Sheppard was made redundant, there has been no council presence at Digbeth Residents’ Association meetings, which is a pity (and contrast to the good attendance from local police officers). When looking for a response from Birmingham City Council with stuff I’ve done on Digbeth is Good, I’ve always found getting one a bit of an uphill struggle, be it waiting in vain for replies to repeated emails to local Councillors about the empty Moseley Road houses in which two squatters died in a fire or asking the press office for a statement about that AWOL Big City Plan bus incident back in 2009. Many thanks to Kelly Quigley-Hicks, who was at the Brewcamp and wrote a great round-up of the session the following day. Anyway, once I’d finished what was admitedly a bit of a frustrated moan (sorry about that) the conversation turned to possible ways of turning this state of affairs around and positively engaging with a local council. Then Dan Slee came up with the brainwave of pooling the suggestions with an open-edit spreadsheet: 101 ways to communicate with your council. It would be great if you could contribute, the more imaginative the suggestions, the better! You’ll notice next to the ‘means of communication’ column there’s another asking you to rate it as either Passive, Aggressive, or Passive-Aggressive. I don’t doubt this classification is overly simplistic and it’s not meant to be taken terribly seriously, just gauge whether you’re making a gentle approach in the hope of a response, exerting gentle pressure to try and encourage one if you don’t feel it is/will be forthcoming or asking for a response in a way that makes refusal difficult or impossible (such as an FOI request). I’ve been very vocal about this on twitter, so it will be news to no-one. From initial StoryCamp musings came a twitter conversation, some further discussion on a specially created Posterous Group (which is a darned good tool that’s worth playing with, if you haven’t already) and from there an Eventbrite page for the event itself on Saturday 1st October 2011 in the lovely town of Ludlow. I’m really rather excited. The StoryCamp image is an unabashed emulation of the title sequence of everyone’s favourite storytelling TV show, Jackanory. I hope you can make it. If you can’t but would like to keep track of StoryCamp goings-on, there is a StoryCamp blog and the twitter hashtag is, unsurprisingly, #storycamp. July 2, 2011 at 6:51 am	· Filed under Digbeth is Good, Doing my thing	·Tagged Arise, film, filum, Ian Nesbitt, Irish Heritage, Long Distance Gang, OutSideFilm, spotted dog, You Gallant Sweeneys!